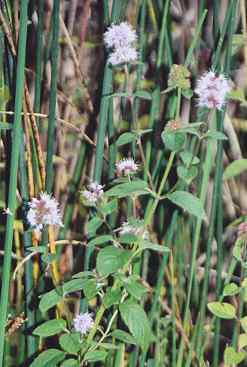 The term Viet­namese mint does not refer to pepper­mint or one of its rela­tives, but to Viet­namese cori­ander, a plant botani­cally not related at all. For culinary purposs, mint leaves should be used fresh in almost all cases; dried leaves are restricted to a few untypical applications only. Charac­teristically pure and refreshing odour, pungent and burning taste. 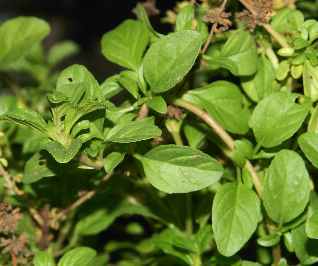 The typical mint scent is most pure in pepper­mint, Ja­panese mint (Mentha arvensis var. 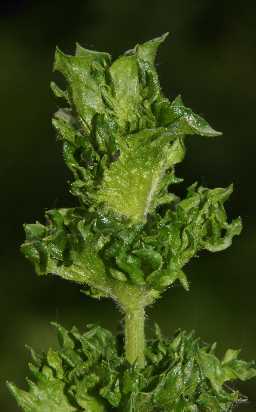 piperascens) and some varie­ties of green mint (Mentha spicata, but not spear­mint), whereas in most other mints addi­tional flavour com­ponents are dis­cernible; for example, crispate or curly mint (Mentha crispa), though minty, some­what reminds of caraway. 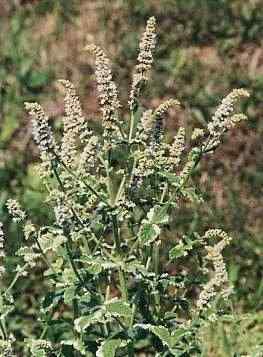 The double­mint flavour of spear­mint is difficult to de­scribe; it’s minty but not pungent. 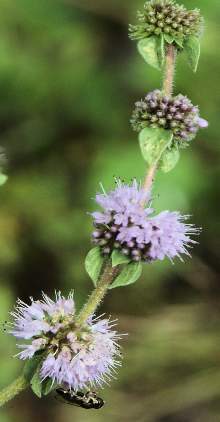 There are, how­ever, yet other mint cultivars whose fragrance bears no similarity with tradi­tional mint aroma: Orange mint (M. citrata, also called Eau de Cologne mint, similar to the bergamot orange used to flavour Earl Grey tea), apple mint (M. rotundifolia = M. longifolia × M. suaveolens, very mild, slightly minty, not reminiscent to apples), ginger mint (M. gentilis = M. arvensis × M. spicata, neither minty nor ginger-like at all) and pineapple mint (M. suaveolens, weakly pineapple-like) These plants are more used as tea herbs than for culinary purposes; still, gifted cooks may find effective applications. The essential oil of peppermint (up to 2.5% in the dried leaves) is mostly made up from menthol (ca. 50%), menthone (10 to 30%), menthyl esters (up to 10%) and further monoterpene derivatives (pulegone, piperitone, menthofurane). Traces of jasmone (0.1%) improve the oil’s quality remarkably. Menthol and menthyl acetate are responsible for the pungent and refreshing odour; they are mostly found in older leaves and are preferentially formed during long daily sunlight periods. On the other hand, the ketones menthone and pulegone (and menthofurane) have a less delightful fragrance; they appear to higher fraction in young leaves and their formation is preferred during short days. 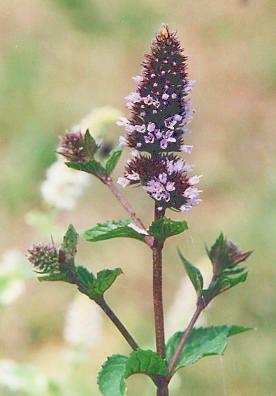 The world’s most im­por­tant source of menthol is, how­ever, not pepper­mint but field mint. Field mint is the only mint species that became natural­ized in tropical Asia; there are many dif­ferent culti­vars, some of which are grown for direct con­sump­tion, others for the distilla­tion of essen­tial oil. 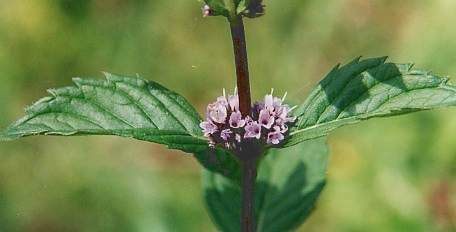 The Ja­panese variety of field mint (Mentha arvensis var. piper­ascens Malinv. ex Holmes), now grown in many Asian countries, may contain up to 5% of essential oil in its tips; more common, however, are 1 to 2%. Chief com­ponent of the oil is menthol (50 to 70%, in rare cases up to 90%). After parts of the menthol have been removed from the oil, the oil is marketed as (dementholized, recti­fied) Japanese peppermint oil ; it typically contains 30 to 45% menthol, 17 to 35% menthone, 5 to 13% menthyl acetate, 2 to 5% limonene and 2.5 to 4% neomenthol. Other terpenes occur but in traces (piperitone, pulegone, β-caryophyllene, β-caryophyllene-epoxide, α-pinene, β-pinene, germacrene D, 1,8-cineol, linalool, menthofurane, camphene). A trace component characteristic for this species and missing in other mints is β-hexenyl phenylacetate. The oil of this so-called Japanese pepper­mint is often attri­buted with an in­credible wealth of useful medical properties; it is even more in­credible, though, that it never failed to help me in a number of dif­ferent in­conve­nient con­ditions like nausea, mild stomach upset or cold. The menthol obtained as a by-product in the recti­fication of Japanese pepper­mint oil is used for medical products and for chewing gum. A com­parative­ly small fraction goes in the pro­duction of menthol-flavoured cigarettes, which have been quite popular in Western Europe a few decades ago. See tonka bean for more on flavoured tobacco products. Whenever high­ly concentrated menthol is used, one must consider that menthol is toxic to infants; there are rumors that it can induce apnoea. Other mints may contain rather dif­ferent con­stituents: Mentha pulegium (penny­royal) con­tains 80% pulegone, and M. crispa (crispate mint) con­tains 50% carvone. Another famed cultivar, spear­mint, owes its phantastic aroma to carvone, limonene, dihydro­carvone, men­thone, pule­gone, 1,8-cineol and β-pinene. Pepper­mint is a (usually sterile) hybrid from water mint (M. aquatica) and spearmint (M. spicata). It is found sometimes wild in Central and South­ern Europe, but was probably first put to human use in Eng­land, whence its culti­vation spread to the Euro­pean con­tinent and Africa; today, Northern Africa is a main culti­vation area. 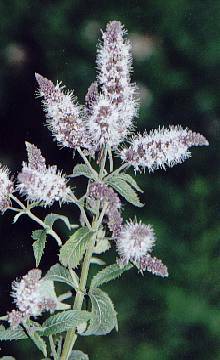 Other mint species are indi­genous to Europe and Asia, and some are used since mill­ennia. Cultivars in tropical Asia always derive from field mint and are, there­fore, botani­cally not closely related to Euro­pean pepper­mint, although they come close to pepper­mint in their culinary value. Mints from Western and Central Asia, however, are com­parable not to pepper­mint but to horse­mint and apple­mint. All species of genus Mentha are aromatic, although not in all of them the aroma is that pure than in peppermint. As a rule of thumb, any mint can be substituted by peppermint, but not always vice versa. The names for mint are fairly uniform in most Euro­pean lan­guages: German Minze, Danish and Nor­wegian mynte, Dutch munt, Basque menda, Estonian münt, Finnish minttu, Czech máta, Polish mięta, Russian myata [мята], Lithuanian mėta, Latvian mētra, French menthe and Italian menta. All these names derive from Latin mentha mint . 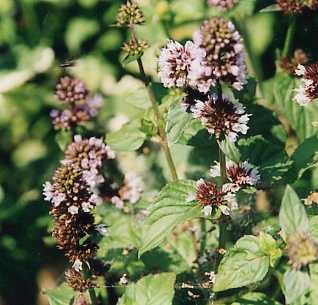 The Latin name mentha itself was borrowed from Greek minthe [μίνθη], whose origin is, however, unknown. It is already found in Mycenaean, the earliest recorded version of Greek, as mintha [𐀖𐀲]. The English ho­mo­nym meaning place where coins are pro­duced or the cor­respon­ding verb are not at all related to the name of the plants; rather, they derive (together with the more familiar money) from the epo­nymous Latin noun moneta, itself being derived from an epi­thet of the god­dess Juno, in whose temple coins were minted. The pepper -element in peppermint, found in many other languages and also in the botanical species epithet, piperita, refers to the peppery and pungent taste of this specific mint type. See also long pepper for the etymology of pepper . In the New Testa­ment, the mint is called hedy­osmon [ἡδύ­οσμον] (see also pome­granate). This com­pound means the sweet smelling one : hedys [ἡδύς] sweet, pleasant (see licorice for more infor­mation) and osme [ὀσμή] smell , related to English odour, cf. Latin olere to smell . In modern lan­guages, names de­rived thence have the meaning green mint, spearmint , not pepper­mint , e. g., Greek diosmos [δυόσμος] and Bulgarian giozum or dzhodzhen [джоджен]. 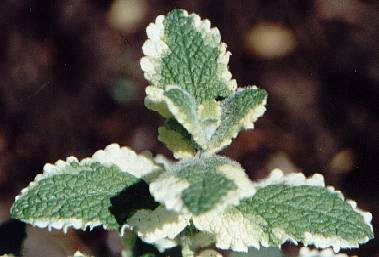 In Semitic tongues, closely similar names for mint may be observed: Arabic an-na'na' [النعناع], Aramaic nanea [ܢܢܥܐ] Hebrew nana [נענע], Maltese nagħniegħ and Tigrinya naenae [ናዕናዕ]; there are also similar forms in languages outside the Afro-Asiatic family, e. g., Turkish nane, Albanian nenexhiku, Pashto nauna and Farsi nana [نعناع]. I don’t know about the exact origin of that group of words, yet it is of ancient origin as testified by Akkadian nīnū. Peppermint and its relatives are mostly known as a medicine and popular herbs for infusions; for example, an infusion of green mint is the national beverage in Morocco and Tunisia. 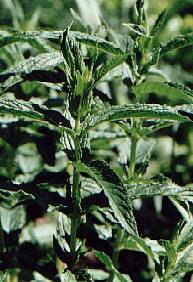 British breeds of green mint are known as spear­mint. They are very popu­lar for fla­vouring cold soups, beverages and meats; together with thyme, spear­mint is the most im­portant culinary herb in Britain. 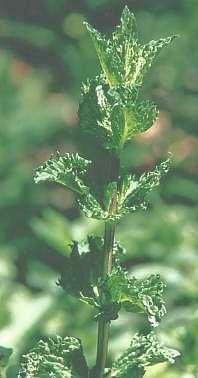 Spear­mint is the mint to use for the famous and often dreaded (by non-English­men) pepper­mint sauce served to boiled lamb. Today, most spear­mint is actually used in the chewing gum industry ( double­mint ). Pepper­mint originated in England, probably due to accidental hybridiza­tion. The oldest cultivar known, Black Mitcham, is named after a town near London; its leaves are dark due to antho­cyanin pigments. Other varie­ties of pepper­mint are free from antho­cyanins and are known as white peppermint . In Britain, as in the rest of Europe, true peppermint is used almost ex­clusively for con­fectio­neries and sweet liquors, where its cooling and fresh pungency balances the sweet­ness of the sugar. 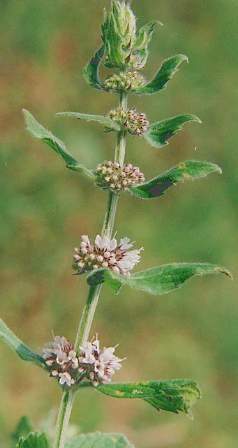 For all such purposes, the usage of pure es­sential oil is pre­ferred in order to avoid the astrin­gent to bitter notes of the pepper­mint leaves. The fresh­ness of pepper­mint goes ex­tremely well with choco­late flavour. Pepper­mint ice cream is especially delight­ful on a hot summer day, making use of the cooling properties of menthol (see vanilla). 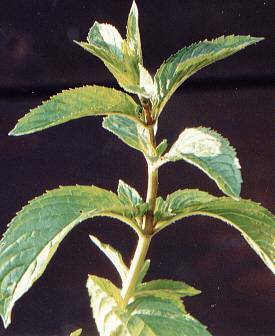 Peppermint is much cultivated in many countries of Europe, Western and Central Asia for the production of menthol, which is needed in pharmaceutical preparations. In most of these countries, peppermint entered local cuisine, replacing in part the native mints. Fresh mint is essential to flavour a celebrated specialty of Carinthia, Austria’s most Southern region bordering Italy, whence the art of noodle-making was imported. Kärntner Kasnudeln (meaning loosely Carinthian cheese-stuffed dumplings or Carinthian cheese-pasta) are basically large ravioli-type noodles stuffed with a mixture of cottage cheese, boiled potatoes and fresh herbs. The herb mixture contains chervil and a special Carinthian mint variety with caraway scent which somewhat remembers spearmint. Boiled or steamed Kasnudeln are served with a few drops of molten butter as a snack between meals, or for dinner. 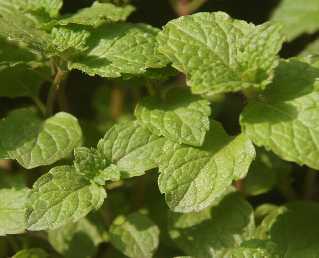 Fresh mint leaves are often used in Turkish cooking to­gether with yoghurt (see garlic for an example); similar con­coctions are in use in Lebanon and Israel (see parsley for the Lebanese salad tabbouleh). All over West­ern Asia, grilled lamb (kabab [كباب]) may be fla­voured with mint, and dried mint is part of the Georgian spice mixture khmeli-suneli (see blue fenugreek). In the Caucasus coun­tries, both regular mint and the related penny­royal (M. pulegium) are used as garnish, which is curious, because penny­royal, though having been an main herb in Classical Roman cooking (see also silphion), is not used in any other con­temporary cuisine. Iranian cui­sine knows several highly sophisti­cated recipes em­ploying mint, for example ghormeh [قرمه] (see feu­greek), which is one of the fe examples where dried mint may be used. Some of these minty reciped were later trans­ferred to North­ern India where they were further developed, e. g., moghul-style biriyani (see saffron). Un­like the Western Asian foods containing mint, the Persian recipes can, at least for my taste, also be prepared with true peppermint. In the Far East, mint is also well known. It is chiefly of im­por­tance in the countries of pen­insular South East Asia, less so in Indo­nesia and China. In Thai­land, local mint varie­ties are milder than Euro­pean pepper­mint, standing some­where in between true pepper­mint and spear­mint. Together with other herbs, mainly basil and coriander (cilantro), mint is used in the hot Thai meat salad laab or larb [ลาบ], which originates from North Eastern Thailand (Isan [อีสาน]). It is commonly prepared from chicken (then known as laab gai [ลาบไก่]) and served with steamed glutinous rice as typical for the Isan region. Coarsely ground chicken meat is dressed with typical Thai flavourings (fish sauce, lime juice, shallots), a liberal amount of dried red chiles, raw vegetables and fresh greens, including coriander and mint leaves. Dried mint is not suitable for Thai recipes. Mint is also highly popular in Vietnam, where fresh aromatic leaves are, in any case, essential for the national character of the food and thus served as a garnish to nearly every Vietnamese dish, particularly in the South. The most popular herbs (besides some that are rarely available in the West) for this purpose are coriander, Vietnamese coriander (also known as Vietnamese mint , which is confusing) long coriander, basil and mint. More often, a mild, spearmint- or caraway-scented mint variety (rau hung lui [rau húng lủi]) is preferred to the more pungent, menthol-containing type (rau hung cay [rau húng cây]); the former is often served with North Vietnamese, Hanoi-type noodle soup (pho bo [phở bò], see Vietnamese cinnamon). See also Vietnamese coriander for further details.